Using a white face painting stick, draw pointed eyebrows over each eye, adding 2 lines on the forehead. Draw 3 horizontal lines, overlapping slightly, under the nose on the top lip, then add some well-spaced stripes radiating towards on the edge of the face. 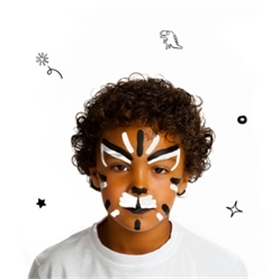 Using a black face painting stick, draw a line above each pointed eyebrow, and add a stripe down the centre of the forehead. Paint the end of the nose and bottom lip, adding a thin triangle on the top lip. Add some more stripes to the edge of the face. 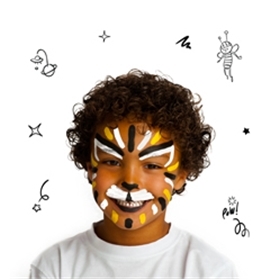 Using a yellow face painting stick, add more stripes around the edge of the face to fill in between the others. 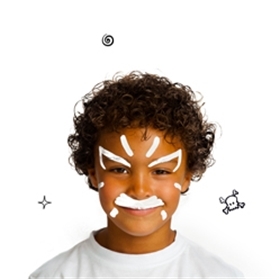 These Face Painting Sticks are easy to use and very handy. You can take them to any party for instant success. 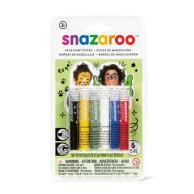 As with all Snazaroo Face Paints, they are easy to remove (wash off with soap), hypo-allergenic and non-toxic.